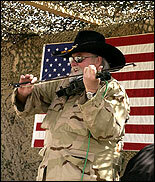 BAGHDAD, IRAQ (CelebrityAccess MediaWire) — When you think of the Charlie Daniels Band, songs like, "In America", "The South's Gonna Do It Again", "This Ain't No Rag, It's a Flag" and "The Devil Went Down to Georgia" come to mind. The common thread running through these hits is that they express a sound that is unique to America and communicates the very spirit of the American people. This week, through the combined efforts of the Tennessee National Guard, United States Army-Europe, Central Command in Southwest Asia, and the nonprofit organization "Stars For Stripes", the CDB took that spirit to Kyrgyzstan, Uzbekistan, Afghanistan, Kuwait, Iraq and Germany. The band traveled more than 16,000 miles and performed up to 3 shows per day for American troops deployed in the war on terrorism. The CDB took every opportunity to see as many of America's fighting forces as possible during the whirlwind nine-day tour which featured several "surprise" performances. Supposedly only stopping through Kyrgyzstan "en route" to Afghanistan, the band delighted the troops with a late evening acoustic performance immediately after their twenty plus hour flight from the United States. Weather conditions prevented their landing at Bagram, Afghanistan, where a concert was planned. The military C130 cargo plane diverted to "K2" in Uzbekistan and within a few hours, the weekly "Bingo" tournament was followed by an impromptu concert by the Charlie Daniels Band. Back on schedule the following day for the flight to Kuwait, the plane stopped in Bagram for refueling. Determined to bring a much-needed morale boost to the men and women in this area who had just the day before lost several of their comrades in a tragic helicopter crash, Charlie insisted on "christening" the Pat Tillman Center which opened earlier that week. Soldiers crowded into the beautiful new facility to listen to the CDB perform and get an autograph and have photos taken with the group. Next for the group was a 9-hour C130 flight in Kuwait to visit the Tennessee Army National Guard's 230th Area Support Group. While in Kuwait, they performed for more than 5,000 troops at Camp Arifjan. Early the following morning the caravan traveled to Camp Victory in Baghdad, Iraq, signed autographs and snapped photos before and after the shows, and entertained more than 3,000 multi-national troops. The group then flew by armed Blackhawk helicopters to Forward Operating Bases Bernstein, Cobra, and Caldwell in Northeastern Iraq, where they visited and entertained the soldiers of Tennessee's 278th Regimental Combat Team. The final leg of the journey brought them back to LSA Anaconda in Baghdad to perform for more than 5,000 troops there. Stopping in Germany on the return trip to the U. S., Daniels was presented with the Commanders Award For Public Service from the United States Army, Europe Commander, General B.B. Bell, for his contributions and unwavering support for the United States Military. "It's amazing to watch Charlie communicate with the troops over here," Said Major General Gus Hargett, Tennessee's Adjutant General. "Charlie is a performer that bridges the gap between generations of Americans. Some of these songs were hits before many of these men and women were born, but you see young and old alike, cheering and singing along with every song the band performs.